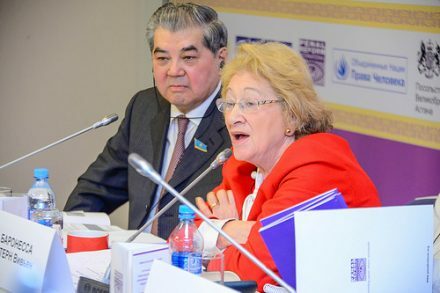 Alison Hannah, PRI’s Executive Director reports from a regional conference in Kazakhstan on the development of prison legislation in Central Asia. In England and Wales, prisons are reaching crisis point. According to a recent report there are only 265 free prison places out of the 85,800 prison estate capacity. Emergency measures may be needed to find additional accommodation; privately run prisons are to be paid more to place two prisoners in cells designed for one to avoid having to use police and court cells. Prisons are now more crowded than they were when the current government came to power in 2009. In contrast, Kazakhstan has adopted a carefully planned approach to reduce its prison population over time. While its prison population is still the highest in Central Asia, between 2010 and 2012 it improved its ranking in imprisonment rates from 22nd in the world to 35th. In February 2014 the government approved a 10-point plan to reduce the prison population and is revising the Criminal Code and Criminal Executive Code to continue this trend. PRI’s Central Asia office is a member of the Parliamentary working group to revise the Criminal Executive Code and on 14 March organised a regional conference to discuss trends and challenges in prison legislation. The conference was held in Astana, with participants from Kazakhstan, Kyrgyzstan and Tajikistan – international as well as national experts, NGOs, MPs, criminal justice and penal professionals. The three countries represented are all seeking to change their legislation and face similar challenges in moving away from the former Soviet-style model. Finding work for prisoners is recognised as a problem in Kazakhstan and employment is seen as key to successful reintegration. While changes to the Criminal Executive Code there mainly focus on humanising conditions of employment, there is concern over a proposal to introduce a short ‘shock therapy’ punitive prison sentence for minor offences. There is no evidence that short prison sentences act as a deterrent (in fact the reverse is the case as research shows that community-based sanctions lead to lower re-offending rates). Consequently instead of the prison population coming down, this new sentence may cause to it go in the opposite direction. Anxiety was also expressed over moves to expand the number of offences for which the death penalty may be awarded. Baroness Vivien Stern presented the case for abolition most persuasively and was supported by most (though not all) participants. Kazakhstan has had a moratorium on executions since 2004 but so long as the death penalty remains on the books, there is the risk that it may be implemented. Despite these concerns, the mood at the conference was optimistic. There was a commitment to improving conditions for prisoners, combating torture, maintaining links with prisoners’ families, expanding alternatives to detention and reducing sentences for petty crimes. While recognising the many challenges ahead, there was an openness to admit uncertainty and a willingness to share and learn from others’ experience, that suggests a determination to continue the progress made so far. Photo: Baroness Vivien Stern addresses the conference. Watch an interview with PRI’s Regional Director in Central Asia, Saule Mektepbayeva on the current situation of the prison system in Kazakhstan (in Russian only).